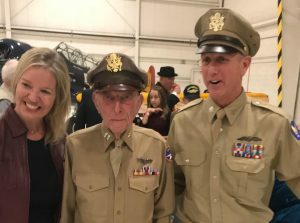 BEDFORD, VA – The National D-Day Memorial Foundation is mourning the loss of Captain Jerry Yellin. This past June, Capt. Yellin delivered the keynote address at the Memorial’s commemoration of the 73rd anniversary of D-Day. 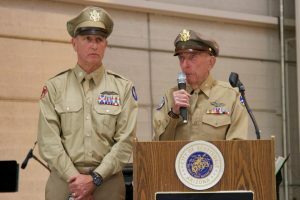 One of the nation’s best-known World War II veterans, Yellin shared his harrowing story of having flown the final combat mission of WWII, in which his wingman became the final American to die in battle during the war. When the veteran paid a visit in June, Yellin became further involved with the memorial and its mission. In September, he raised the flag to open the National D-Day Memorial Golf Classic and played as a celebrity guest golfer. One of Yellin’s final interviews was recorded at the National D-Day Memorial in October, as he joined the Memorial’s capital campaign as honorary Chair. Though well-known for his role in the war, Yellin often said he was just one of more than 16 million young Americans willing to fight for freedom in WWII. Yellin’s message and dedication to his fellow veterans will live on through his books, speeches, and interviews. Staff, board, and volunteers at the foundation offers their deepest condolences to Capt. Yellin’s family and many friends. The last combat mission of World War II began Aug. 15, 1945, when fighter pilot Jerry Yellin and his wingman, 19-year-old Philip Schlamberg, took off from Iwo Jima to attack airfields near Nagoya, Japan. The war seemed all but over. Germany had surrendered in May, and much of Hiroshima and Nagasaki were in ruins, decimated by atomic bombs dropped the previous week. If Mr. Yellin heard a code word — “Utah” — Japan’s rumored surrender had occurred, and he was to cancel his mission and return to Iwo Jima, a rocky island that he had helped secure months earlier and that offered a base for American bombers headed north to Japan. Later that day, on what was still Aug. 14 in the United States, Emperor Hirohito announced Japan’s surrender. For some reason, however, Mr. Yellin and Schlamberg never got the message. Taking on antiaircraft fire in their P-51 Mustangs, they strafed their targets and headed home, passing through a thick bank of clouds. Schlamberg, who had previously admitted a sense of foreboding to Mr. Yellin, saying, “If we go on this mission, I’m not coming back,” never emerged from the haze. Disappearing from Mr. Yellin’s wing, he was presumed dead and considered one of the last Americans to be killed in combat during World War II. Mr. Yellin, who landed on Iwo Jima to discover that the war had ended three hours earlier, and who later became an outspoken advocate of veterans with post-traumatic stress disorder, died Dec. 21 at his son Steven Yellin’s home in Orlando. He was 93 and had lung cancer, his son said. “The sights and the sounds and the smells of dead bodies and the sights of Japanese being bulldozed into mass graves absolutely never went away,” he told the Washington Times in August. Mr. Yellin, a captain in the 78th Fighter Squadron of the Army Air Forces, counted 16 downed pilots in his unit during the war, including Schlamberg. For years afterward, he struggled to keep a steady job, moving a dozen times in the United States and Israel (where he settled, at one point, partly in protest of the Vietnam War). Mr. Yellin soon began speaking to other veterans who struggled to adapt to civilian life, and in 2010 he co-founded Operation Warrior Wellness, a division of the David Lynch Foundation that helps veterans learn Transcendental Meditation. He said he was inspired to start the group after a friend and Army veteran killed himself that year. Mr. Yellin received support in promotional videos by actress Scarlett Johansson, a grandniece of Schlamberg. “The feeling that one has when a buddy dies? You just can’t emulate that. We have a burden civilians will never understand,” Mr. Yellin told The Washington Post earlier this month, shortly after the release of “The Last Fighter Pilot,” an account of his World War II service written with Don Brown. View Photos Remembering those who have died in 2017. Jerome Yellin was born into a Jewish family in Newark on Feb. 15, 1924. His father was a real estate developer. Mr. Yellin had just graduated from high school in Hillside, N.J., and was working the night shift at a steel mill, saving money before starting college, when Japanese forces bombed Pearl Harbor on Dec. 7, 1941. Two months later, on his 18th birthday, he enlisted in the Army Air Forces, pursuing an adolescent love of aviation that had led him to build models of World War I-era planes. Mr. Yellin was slightly nearsighted and initially failed an eye exam for pilots. “The doctor told me to go home and stay in a dark room, eat a lot of carrots, don’t read anything and come back in three days and take the test again,” he said in a 2014 oral history. In place of the rabbit food, he sought help from his mother, who served on the draft board. She filched a copy of the eye chart, allowing him to memorize the letters and pass the exam on his second try. Mr. Yellin proved a skilled pilot, successfully bailing out of his plane when the engine locked up during a training mission near Hawaii (he said he spent nine hours in a life raft before he was picked up by a boat) and escorting B-29 bombers on 19 missions over Japan. 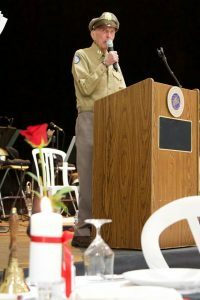 His military honors included the Distinguished Flying Cross and Air Medal, and in recent years he served as the national spokesman for the Spirit of ’45, a nonprofit organization that promotes the legacy of World War II veterans. His wife of 65 years, the former Helene Schulman, died in 2015. Survivors include four children, David Yellin of Winter Haven, Fla., Steven Yellin of Orlando, Michael Yellin of Montclair, N.J., and Robert Yellin of Kyoto, Japan; a sister; and six grandchildren. Mr. Yellin’s son Robert later moved to Japan and became engaged to a Japanese woman. Mr. Yellin was shocked when he found out her father, Taro Yamakawa, trained as a kamikaze pilot and worked at an airfield during World War II. The fathers bonded, Mr. Yellin said, after discussing their flying strategies and experiences during the war with the help of a translator. They eventually struck up a correspondence, and Mr. Yellin described Yamakawa as his best friend. Jerry spoke at the 1940″s themed fundraiser benefiting, Thunderbird ll and Dreamcatcher on November 10th, 2017. 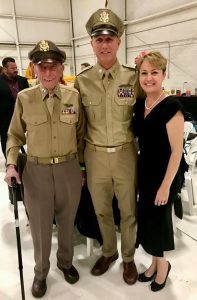 We celebrated our heroes at the Inaugural Swing Time – 1940’s Hangar Party fundraiser. We had WWII Captain Yellin as our honored guest and speaker. Amazing night, proud to be an American. Thank you to Alerus Bank and other event sponsors and attendees for celebrating with us. And thank you to the men and women that serve our country – past, present and future. 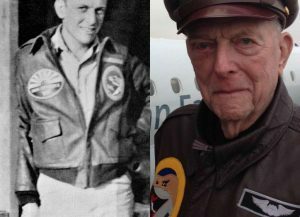 World War II pilot, 93-year-old Capt. 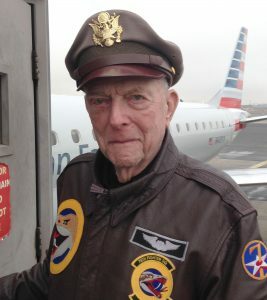 Jerry Yellin, was once again in the pilot’s seat during a special flight on Nov. 9. Capt. 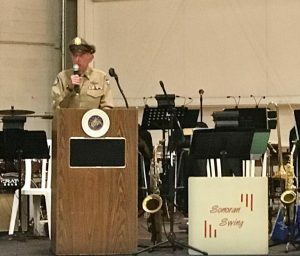 Yellin took part in a Veterans Day appreciation event, in anticipation for the inaugural “Swing Time” 1940s-themed party and gala that will benefit the Thunderbird Field II Veterans Memorial and DreamCatchers on Saturday, Nov. 10. Capt. Yellin is a former fighter pilot who flew the final combat mission of World War II and is the subjection of the best seller, “The Last Fighter Pilot,” and an upcoming Hollywood documentary. The aircraft is a rare WWII Stearman, the type Capt. Yellin trained in during 1943. Capt. Yellin and the Memorial’s Chairman, Steve Ziomek, piloted the plane together. Capt. Yellin, who still speaks nationally concerning PTSD, will also be the honored guest and keynote speaker at the “Swing Time” party and gala. On Nov. 11, he is scheduled to travel to the Richard Nixon Presidential Library in California to address the Veterans Day celebration there. Thunderbird Field II Veterans Memorial Inc., is a non-profit organization 501(c)3 aimed at preserving the history and culture of aviation in Scottsdale, providing a tribute to veterans and create unique educational opportunities for our school children. Thunderbird Field II graduated over 5,500 pilots, many of whom saw military action in Europe and the Pacific. The school was deactivated on October 16, 1944 and is now the Scottsdale Airport. http://captainjerryyellin.com/wp-content/uploads/IMG_3303.jpg 1512 2016 sitepreview45 http://captainjerryyellin.com/wp-content/uploads/Captain_Jerry_Yellin_Official_Website_Logo_Reg.png sitepreview452017-11-10 15:33:592017-11-10 15:38:53World War II pilot, 93-year-old Capt. Jerry Yellin, was once again in the pilot’s seat during a special flight on Nov. 9. 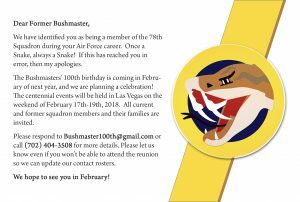 The 100th Anniversary of the Bushmaster’s (78th Fighter Squadron) will be held in Las Vegas on February 16, 2018.
http://captainjerryyellin.com/wp-content/uploads/78at100_PostCard_FRONT_A_4x6_bleed-e1509722735269.jpg 269 400 sitepreview45 http://captainjerryyellin.com/wp-content/uploads/Captain_Jerry_Yellin_Official_Website_Logo_Reg.png sitepreview452017-11-03 15:23:102017-11-03 15:27:05The 100th Anniversary of the Bushmaster's (78th Fighter Squadron) will be held in Las Vegas on February 16, 2018. Yellin enlisted two months after the bombing of Pearl Harbor, on his 18th birthday. After graduating from Luke Air Field as a fighter pilot in August 1943, he spent the remainder of the war flying P-40, P-47 and P-51 combat missions in the Pacific with the 78th Fighter Squadron. He participated in the first land-based fighter mission over Japan on April 7, 1945. 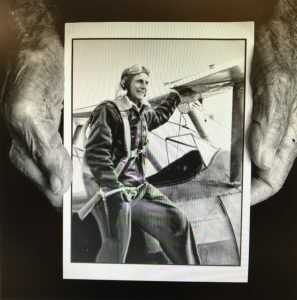 During Yellin’s final mission on Aug. 14, 1945, his wingman – Phillip Schlamberg – had the tragic distinction of becoming the last man killed in a combat mission in World War II. According to his website, Yellin battled severe, undiagnosed post-traumatic stress disorder after the war. 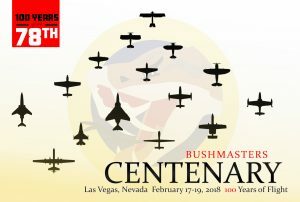 The decorated pilot, now in his 90s, still travels around the country, speaking at events. Quesinberry said Monday’s presentation is one of a dwindling number of opportunities to hear directly from a World War II veteran. The NHS History Speaker Series features a free, public presentation in the fall and spring of each year with one focusing on the the Vietnam War as part of the 50th Anniversary Commemoration. The NHS History and Social Studies Department is a commemorative partner with the Department of Defense. Jerry Yellin, left, and Susan Marella, right, share memories and page through photos and clippings of Marella’s father, Eugene O’Brien. Like Yellin, O’Brien was in the Army Air Corps in the Pacific in World War II. FAIRFIELD — When people think about the end of World War II, they tend to think about the grand events. VE Day. The atomic bombs. The surrender aboard the USS Missouri. Few think of a young captain flying on Aug. 14, 1945. Jerry Yellin took off from Iwo Jima for an attack on Tokyo with wingman Phillip Schlamberg. By the time Yellin landed the war was over, and Schlamberg was the final American combat death. “I gave him a thumbs up, he gave me a thumbs up,” Yellin said, and they turned for home. Schlamberg didn’t make it back. The war ended that day, but it stayed with Yelin for 30 more years. Now 93, he was in Fairfield on Saturday to tell his story. The years have been kind to Yellin physically. He has a piercing gaze and a firm handshake. He has the National D-Day Golf Tournament to play in later this month. The annual Army-Navy football game in December is on the schedule, too. That’s now. The decades after the fighting ended were hard. Yellin had what would now be recognized as post traumatic stress disorder. Brought up on the injunction “Thou shalt not kill,” Yellin had done just that and been rewarded for doing so. To Yellin, killing people is evil. But that’s what war is. And the United States was faced with truly evil regimes that had to be stopped. But that doesn’t mean he believes anyone should revel in the necessity of killing people. Yellin’s visit was less a speech or lecture than a reunion. He chatted with people, answered questions. He signed every copy of “The Last Fighter Pilot,” a book Dan Brown wrote with and about him, placed in front of him. It was a place for memories for everyone, including those who came to hear Yellin. Susan Marella’s father, Eugene O’Brien, was in the Pacific theater at the same time. The parallels were striking. “I thought they could have been in the same squadron,” she said. They weren’t. But Yellin remembers playing golf at the very same course Marella’s father played on. Together they paged through a book with clippings and photos of O’Brien. Yellin pulled up a photo of himself on his smartphone, one taken during the war. Like Yellin, O’Brien didn’t talk about the war much in the decades after it ended. A large group of his friends from school died in a plane crash after enlistment. It was a flight that, except for fate, O’Brien himself might well have been on. The stories came late in O’Brien’s life. “He was starting to talk about the loss of it, the loss of his friends from high school,” Marella said. That makes sense to Yellin. It’s easy to learn about the major battles or the leading generals from articles and films taken during the war or shortly thereafter. Stories about the men waited as the veterans themselves worked out how to tell them. Now, it’s time. It’s duty. “I feel obligated that it’s told properly,” Yellin said. Now, 72 years later, it’s time.